I did mange to stop by the mall this weekend to use my coupon. 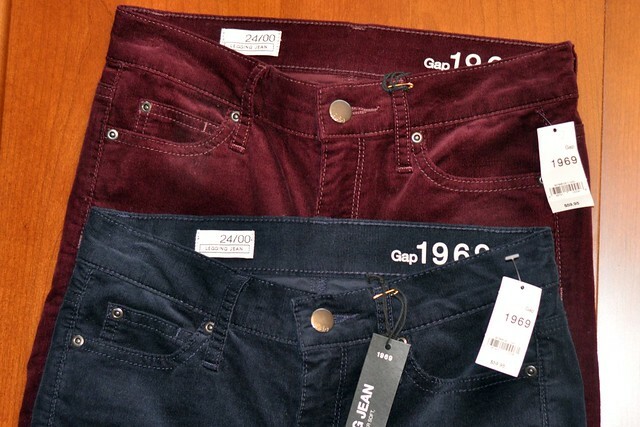 I picked up the GAP lightweight corduroy leggings in both justice blue and aubergine. Yesterday, they were 60% off. I got an additional $5.00 off my purchase with this coupon. After both discounts, the price dropped to around $21.00 per pair (was $59.95). Not too bad, right? Today, you can take 40% off your entire purchase plus an additional $5.00. The price is still pretty decent. I am almost positive that you don't have to have this coupon with you. As long as you're going to use your Gap/BR/ON card to pay, the SA will honor the discount. The measurements are as follow if you're interested (for a 24/00 regular): waist = 13", length = 37". For some reasons, they fit much better than the last ones I tried. I hope you enjoy the rest of your weekend. I can't believe Thanksgiving is just a few days away. Any plans for Black Friday shopping =)? I am so glad you picked up the GAP cord in wine, Sidney. I know it'll look super fantastic on you! I love the aubergine leggings! Too bad we don't have Gap here .. sigh! I love the colors you chose!! Thanks for the heads up on the sale! ughh I've been waiting for a good coupon or sale for the aubergine pair, but now that I DO have coupons, the sizes are all sold out. -_-'' soo sad..
Can't wait to see you style the aubergine cords - such a luxe color! Oh man, what a weekend of college football! So many good games, but so many upsets (I'm a fan... unless it's my school that's on the losing end, muhaha)! I think I really need to get a Gap/BR/ON card simply for all these deals. 60% off is amazing and I can't wait to see these leggings on you! PS - Love the corduroy in the dark red. Gorgeous for fall and winter! thank you for the coupon link sydney! I can't believe I missed the 60% off in stores. womp.